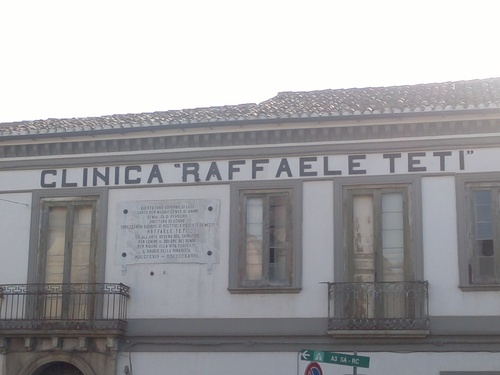 The "Raffaele Teti" Surgical Clinic is in Sant'Onofrio (Strada Provinciale 4, Piazza Umberto 1). The clinic was founded in 1914 by Raffaele Teti, and remained open until 1962. 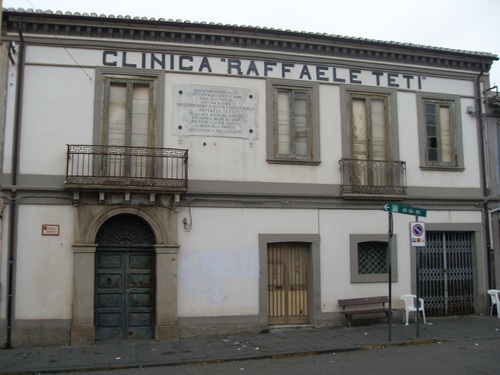 The clinic was the only hospital unit in the district of Vibo Valentia in the period between the two World Wars and in peacetime - due to the closure of the Vibo Valentia's Hospital - and the first hospital unit endowed with radiological equipment. The clinic was open ten months per year; in the other two months Raffaele was usual to go to Rome or abroad to update his medical knowledge and to hire German graduate nurses, able to help him into the operating room. The founder also published a periodical statistic clinic report, in which were explained the different types of surgical operation made inside the clinic and also their number, the types of surgical anesthesias, the number of people that were treated inside the clinic - also divided into categories depending on their hometowns - and the results of the operations. After the death of the founder Raffaele, the clinic was administrated by his younger brother Luigi Teti for over 32 years. The memorial tablet celebrates and commemorates the founder of the clinic.